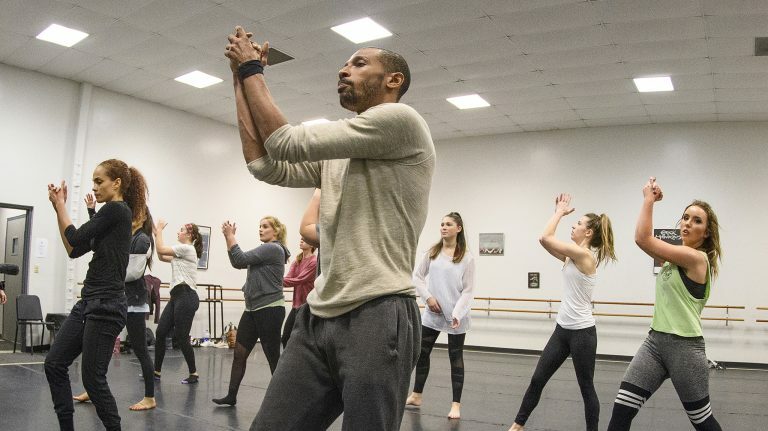 A University of Mississippi theatre arts professor is giving eight students the opportunity of lifetime to study modern dance in Cuba. Malpaso Dance Company, one of the most sought-after Cuban dance companies, partnered with the Department of Theatre Arts and Mississippi: The Dance Company to instruct students in Oxford this month and for two weeks in Havana in December. Their work culminates with a Jan. 27 performance alongside Malpaso at the Gertrude C. Ford Center for the Performing Arts. Jennifer Mizenko had the idea of leading a class to Cuba about a year ago, and has worked to put this course together since. Once the idea materialized, she researched dance companies and found Malpaso, which proved to be a perfect fit for the program. Mizenko approached Julia Aubrey, director of the Ford Center, earlier this year about the possibility of sponsoring a performance by the dance company. Aubrey was immediately supportive of the initiative, which directly supports the educational goals of the Ford Center. “I believe arts collaboration is an important aspect of the mission of the Ford Center,” Aubrey said. “Since this project involved an enhanced cultural experience for the university students and our Ford Center patrons, I accepted her proposal to share resources and contracted with the international company to present Malpaso in January 2018. 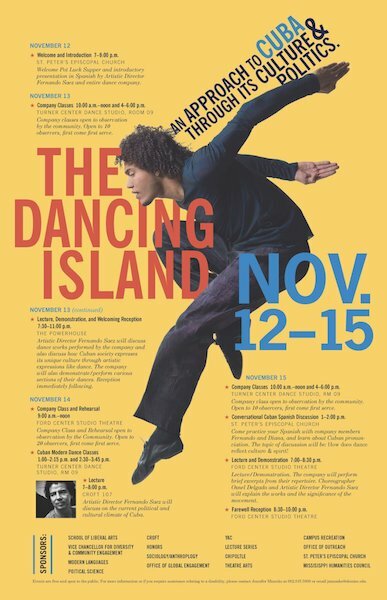 Osnel Delgado, Malpaso’s artistic director, one of the company’s founders and professor of dance studies at the National Dance School of Havana, will teach participating students a new and original work during International Education Week, Nov. 13-17. The dance company will rehearse with students throughout the week and also visit other courses to promote international education. Alexis Boucugnani, a sophomore theatre arts major from Athens, Georgia; Madeleine Bradley, junior exercise science major from Memphis; Maddy Friedman, freshman elementary education major from Madison, Wisconsin; Mary Lacy Lusk, junior general studies major from Troy, Alabama; Rachel McKellar, junior English major from Purvis; Makenzie Menaker, freshman general studies major from Mobile, Alabama; Lydia Myers, junior theatre arts major from Laurel; and Victoria Penegor, sophomore mathematics major from Breckenridge, Colorado, each auditioned for a slot in the two-week course. Students will live with Cuban families for two weeks, Dec. 9-23, while studying in Havana. They will spend several hours rehearsing each day while also learning about the history of Cuban rhythm, taking a salsa class, visiting museums and touring Old Havana. Though students will study primarily dance technique, they also will be assigned reading while in Cuba and will be asked to reflect on how the movement they are studying reflects the country and its culture. They also will have opportunities to work with Delgado’s parents and Cuban dance icons Esteban Delgado Betancourt and Idania Wambrug Rodriguez. Betancourt was a dancer with Danza Contemporanea Cuba for more than 15 years, and Rodriguez is a teacher at the National Dance School of Havana. Mizenko hopes the students, who are from all different majors and backgrounds, will develop a greater understanding of professional dance and a choreographer’s vision, as well develop a greater independence and awareness of living and working in a different culture. Even though travel is open between the United States and Cuba, the process of putting an entire course together remains more difficult than if traveling to other countries. U.S. citizens still need to secure visas through one of 12 reasons to travel to Cuba – in this case, education. The Study Abroad Office has worked closely with International Studies Abroad, a study abroad program provider that has assisted in implementing this program. “ISA has been working on custom programs in Cuba for many years, so we were confident that they would be a strong partner to assist us with the logistics of the program,” McElroy said. ISA has paired students with host families, assisted with securing travel visas, arranged transportations and planned educational excursions for the group.